Concentric Power has a unique approach for on-farm power. First thought when you mention a California startup company with a technical bent is a new iPad app. Or maybe something hot and heavy for social media users would be expected. Concentric Power is neither of those, but this company is bringing its own brand of innovation to the market with some smart iron and a unique system that has benefits for a wide-ranging kind of farm, in addition to other critical industries. Farm Progress caught up with Brian Curtis, CEO and founder of Concentric Power, and he shared what makes his product, and company, a little different. First off, while the name “power” is a key to the product, making power on-site with natural gas is just the beginning. Not many row crop farmers have a need for larger-scale refrigeration today, but for vegetable producers around the country tied into the electric grid, Concentric Power offers an alternative to rising electric rates. Curtis noted that for many specialty crop producers, money goes to large systems that use ammonia to chill food, and power comes from the electric grid. That same power also provides lighting and more in the operation. With the generator-refrigeration combo from Concentric, a farmer can get power from natural gas to run systems on the farm and have that added benefit of refrigeration from a single unit — all powered by natural gas. “They can effectively disconnect from the grid,” Curtis says, though the company doesn’t actually recommend getting rid of electric lines. But there’s an attractive quality to a system that does double duty and helps reduce the electric power bill. This is a modular-designed system, with the smallest unit at 400 kilowatts. But Curtis can connect those modules up to 2.5 megawatts, like building blocks. “We can mix and match units, and put in as many as you need in a row,” he says. Based in California, Curtis grew up in what he calls “Steinbeck country,” near Salinas in Monterey County just south of San Francisco. This is home to 85% of the fresh vegetables delivered to supermarkets and restaurants, as well as a major cluster of cooling and cold processing facilities. With his degree in mechanical engineering and work as a refinery engineer, Curtis gained a heavy education in process power, too. 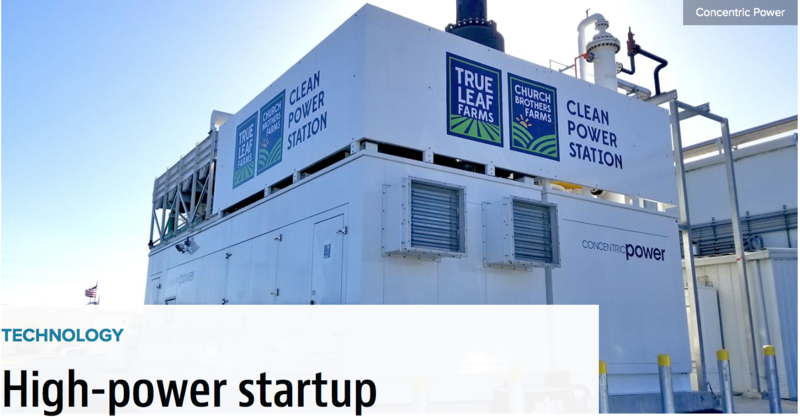 He built connections that eventually led to an opportunity to have venture capital interest in clean tech, and this power plant design — where waste heat gets a second life as a refrigeration system — made sense. Now 6 years old, the company is branching out and growing. “We have interest in systems all over North America,” he says.